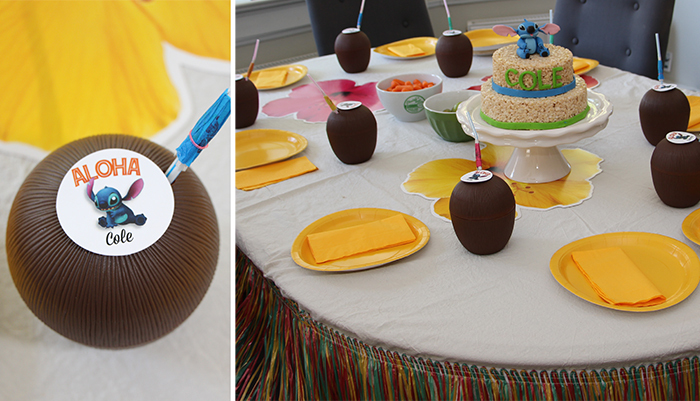 Hawaiian Stitch Themed Birthday Party and a “Cake Free” Cake! 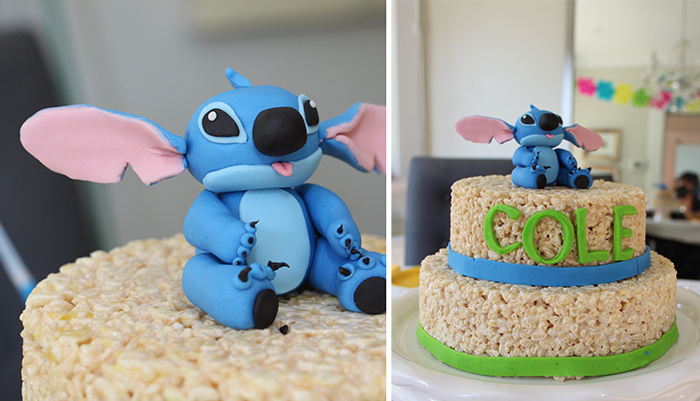 My son requested a Stitch-themed birthday party. This year was going to be different, I was going to create less work for myself! To do this, I planned to make him a cake that he would actually eat and do away with the “traditional” cake. I usually make a traditional cake for the rest of the kids and make him a pie. But not this year. This year I had a plan…a Rice Krispies Treat cake! Easy to make, easy to mould, and loved by all. Turns out I am not the first person to think of this. If you Google Rice Krispies cake, tons of great inspiration comes up. 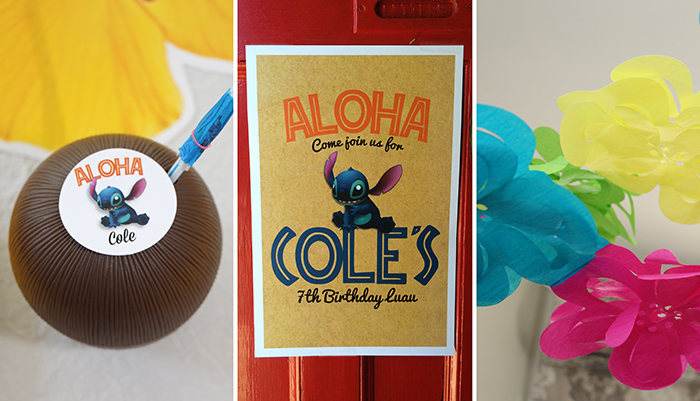 Aloha and welcome to Cole’s 7th birthday party! I found some great Hawaiian theme party items at The Amazing Party Store: coconut shaped cups, colourful garlands and small drink umbrellas. 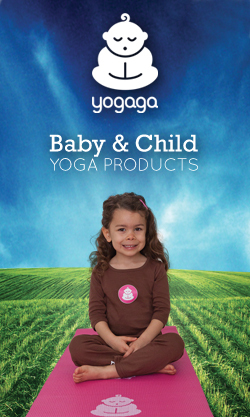 I created an agenda, which was great at keeping myself organized, and the kids loved knowing what came next. 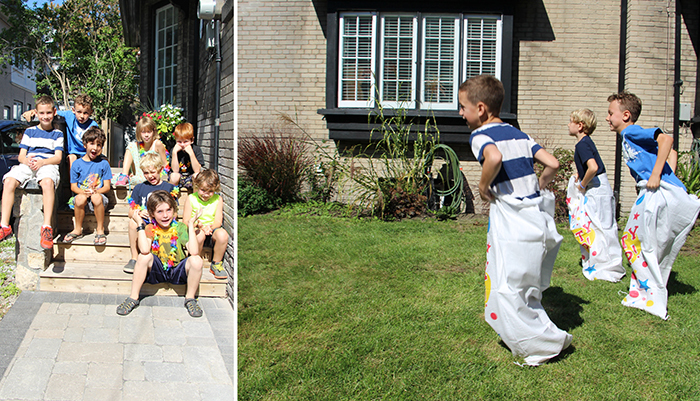 Among the many items were hula hoop contest, potato sack race and cupcake decorating. I purchased dollar store containers for the kids to put their assembled creations in to take home. The cake turned out great. I made two batches of Rice Krispies Treat mix and pressed it into pre-sprayed cake tins (once hardened, I slid a rubber spatula all around the edges and it slide right out. I found a video on Youtube by Francesca Sugar Art to create the Stitch character. With the leftover fondant I created Cole’s name and made some trim for the cake to clean up the edges.